Guitar-based music has been thriving on a steady diet of drive, delay and reverb for so long now. I believe this is due to the flavor-enhancing nature of these three staple effects. Meanwhile, tremolo, phaser, flanger, and chorus effects tend to be accentual rather than always-on units, sitting on the sideline until that key moment of engagement. Because of this common occasional use of modulation effects, most boards I am seeing these days have a multi-effects-style unit handling all the mod duties required to get through the gig or session. Even if one is like me and prefers a dedicated analog pedal for each modulation effect, the four units detailed in today’s feature can still be godsends for pedalboard streamlining. Indeed, these four killer all-mod-boxes can be tweaked to match and even go beyond the sonic capabilities of old analog effects, so one can keep the fragile pricy vintage units in the studio for safe-keeping. Let’s dig in. Alexander’s Waveland is the newest and perhaps most compact multi-mod on the tone block. The tonal trifold of Tremolo, Chorus and Phaser covers most guitarists’ waveshape-shifting needs, while giving the lesser-used Uni-Vibe and flanger effects a miss. However, the Tweak knob can be fine-tuned to achieve ballpark approximations of both—almost like mixing primary colors to make secondary and tertiary shades. For example, in phaser mode, the Tweak dial can be set low to minimal feedback, replicating the subtle two-stage phasing of a vintage MXR Phase 45 or watery Uni-Vibe type of effect. This is fantastic for Robin Trower-type riffing and one can take the speed from slow cascading ebb-and-flow into swirling Doppler vertigo with the Rate/Ramp switch. In Chorus mode, the Tweak knob brings in more detuned voices for lush layers of density and movement. At minimal settings, with one detuned voice accompanying the dry signal, setting the Rate slow and the Mix high can yield a watery Andy Summers or The Wall-era Gilmour flange-chorus effect. Things can get more angular and flanger-like when dirt is placed before the Waveland in this mode. This is great for John McGeoch, Alex Lifeson, Rikk Agnew or Geordie Walker distort-flange-chorus tones. Adding additional voices brings the Waveland Chorus into that lovely old candy cream shoegaze-y Yamaha SPX-90 Symphonic setting realm. The tremolo settings can do sinewave throb to segmented chop and thanks to the high headroom of the circuit, the Waveland is just as comfortable in the effects loop of an amp. This is a hard modulation package to beat for simplicity, versatility and tonal quality. This brain-blower of a modulation pedal comes from one of the most criminally unsung pedal manufacturers today: GFI System. Indonesian builder Henry Widjaja founded the company in 2010 and since then, he has designed some seriously ambitious pedals that deliver futuristic tone and functionality on an Eventidal scale. 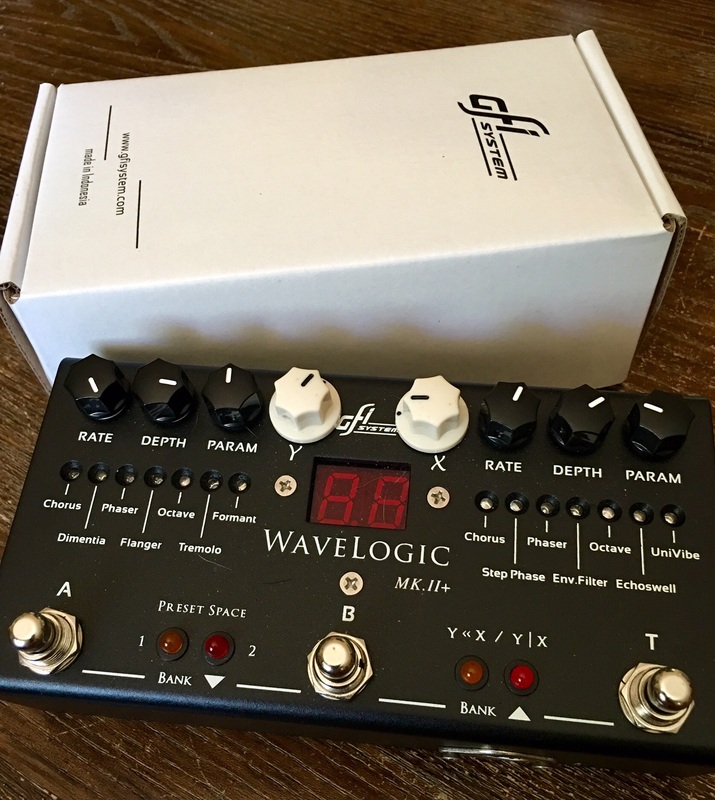 In fact, the WaveLogic MKII goes beyond the Strymon and Eventide units in the ability to combine two modulation effects simultaneously with just the single unit. To add to this, the WLMKII sports a whopping 14 studio-class algorithms. The staple set of Chorus, Flanger, Vibe, Tremolo, Phaser and even Octave is onboard. Things get really interesting when one combines these bread-and-butter effects with the included Dimentia, Echoswell, Step Phase, Formant and Envelope Filter. I will give a brief overview of these more esoteric offerings. Dimentia—as a Tone Reporter may have already guessed—replicates the subtle tonal enhancement of an old Boss Dimension C. Basically, it is a chorus effect with the predictable pitch deviation cycles obscured. This is almost like a free-floating apparitional accompanist for the core tone. Echoswell brings in the input signal gradually in a volume pedal fashion and is followed by successive echoes. This can create huge soundscapes on the fly without the need for a volume or delay pedal on the board. Formant is a curiously courageous offering that accentuates the guitar’s human vocal-like frequencies. In an almost talkbox-ish fashion this filter can be percolated and enhanced by overdriven signals for that “Kickstart My Heart” ‘80s metal vibe. As if this was not enough, there are some self-explanatory extra algorithms—Tape Flange, Chopper and Quack. Hats off to GFI System for daring to be different and being unafraid to venture deep into digital effects design. This was one of the first rack-in-a-box modulators I had the privilege of tweaking. Like the previous entry, it has a ton of effects crammed into one tiny enclosure. The Chorus’s Dual and Quad modes are lush and pristine—more like a rack unit than a BBD pedal in voicing, but extra cool when the Lo-Retain is increased. This essentially applies the chorusing to the high frequencies only, thus creating a more subtle shimmer with all the low-end beef intact. This feature alone makes the Orbital a top choice for bassists and extended range guitarists. The Flanger’s Classic, Thru Zero, and Shadow settings are equally digital rack sounding in nature and take some dialing to get right. Resonator is a super cool static flange-like effect. It works much like the Matrix setting of an old Electric Mistress, although there are many more peripheral parameters to tweak—future-funkers will love the frozen frequencies here. Last but certainly not least comes the Phaser settings; in my opinion, the Orbital’s strong suit. The Vibe setting is still one of the best Uni-Vibe algorithms I have heard; it is particularly cool when using Source Audio’s Expression Controller set to vary the Speed. Unlike the Chorus, Flanger and Resonator effects, the 4–12 Stage Phasers onboard the Orbital are as chewy, thick and syrupy as vintage units—perhaps this is why Source Audio chose orange as the Orbital’s color. For Vibe and Phaser freaks who use other modulation effects sparingly, this is the one to grab. It couldn’t be a multi-modulation box feature without mention of the mighty Mobius. Though others are rising in the ranks fast, Strymon has long-been the one to beat for analog warmth through digital tech. This is what Strymon is known for doing best. Since the Mobius has been detailed to death and reviewed countless times, I will spare the individual algorithm descriptions. I will simply say that this is the top-shelf option for those looking to archive their favorite vintage modulation pedal collection in an instantly recallable library of tone. Simply A-B the Mobius with a vintage unit of choice that corresponds with the selectable Modulation Machine, tweak to match, and store. This do-it-all mod-box of delights sports another super-cool feature that is seldom seen—the Pre/Post switch. This enables one to reroute the modulation effect without rearranging the pedalboard—genius. For those who wish to have all their modulations in one box with true stereo rig integration and MIDI control, get amongst the Mobius. These four pedals described in this feature represent a tonal shift in digital technology. I have always enjoyed digital delays and reverbs, but until quite recently I have been largely underwhelmed by digi-mod-effects. I still haven’t heard an algorithmic chorus or flanger tone that will make me put away my BBD devices, but these offerings come damn close and I suspect it will get better by the year—Robert Keeley is next on the multi-mod block I’ll wager and his 30 ms ADT might make me retract that previous statement. Keep the ears peeled, ignore what is going on under the hood for a bit and let the waves of inspiration take us into the future.